This cooktop is designed to have an industrial look inspired by high-end appliances, but what really matters is how the 36-inch Frigidaire Professional FPEC3677RF electric cooktop (MSRP $1,399) performs. We put it through the same battery of tests we use on every cooktop we evaluate to see how well it performed. We evaluated its features, checked high and low temperatures for each of the burners, examined how quickly it can boil water. We scored on a scale of 10 compared to the rest of the cooktops we've tested this year. Here’s what we found. SpacePro Bridge Element—Allows you to combine two elements into one for large pots or griddles. Keep Warm—Keep dishes warm while the rest finish cooking. Nine and a half minutes on average, but as fast as just under four minutes on the right front outer burner. 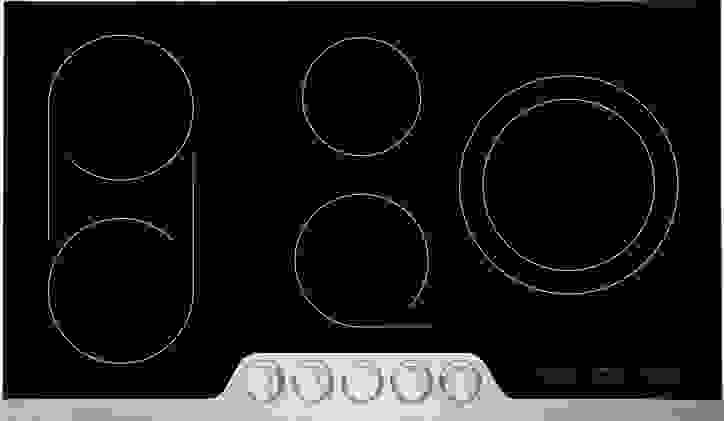 The slowest (center rear burner) clocks in at about fourteen and a half minutes, which still isn’t bad, giving this cooktop a score of 7.4/10. A pan reached a temperate 774ºF on the left rear burner, other burners hovered between 548º-769º F. This is a good score compared to the other ranges we’ve tested with a score of 8/10. A pan reached 115ºF on the center rear burner, other burners hovered between 120º-140º F. This is a great score compared to the other ranges we’ve tested with a score of 8.9/10. Yes. This electric cooktop excels in reaching both high and low temperatures and has great range and versatility across burners. The bridge burner allows you to create a large cooking surface, perfect for large pans and griddles, and it’s a reasonable price for the caliber of its cooking ability.